BlueVPN is actually not an application for Nokia N8 neither any other Belle smartphones, but its an Application designed for Android smartphones / Tablets (4.0 Ice Cream Sandwich & Above). The purpose of this application is very simple yet most wanted. Many people these days have at-least one Android smartphone or a tablet. Usually we want to share an internet connection from our Nokia Symbian Belle Devices to Android with JoikuSpot application and it fails to share internet connection with Android smartphones / tablets. Although JoikuSpot app works fine for sharing an internet connection from Nokia – Nokia smartphone. BlueVPN helps to initiate the internet connection between Nokia Belle smartphones & Android Smartphones / tablets over Bluetooth connection. 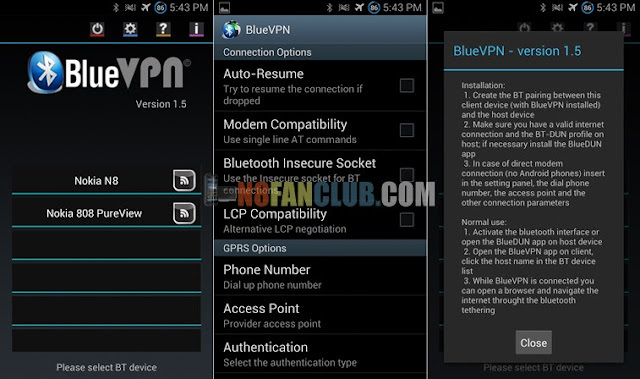 All you have to do is to install the attached APK file on your Android Smartphone or Tablet then enable Bluetooth on your Nokia Belle smartphone and begin to pair the BlueVPN app with your Nokia Belle smartphone. Accept the security & confirmation prompts on both devices (Your Nokia Device & Your Android Device). BlueVPN will automatically initiate internet connection on your Nokia Belle smartphone and will share it over Bluetooth with your Android Smartphone / Tablet.